Essential. The fact is that in the wet the wheels of your bike will throw up water at the rider. Mudguards, front and rear, are one of the key pieces of kit to keep you dry. They are usually easy to attach to your bike to small eyelets located around the dropouts on your forks. Usually all you’ll need is an Allen key and a pair of pliers or an adjustable spanner to grip the bolt on the backside. 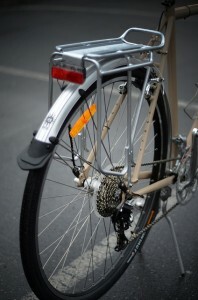 You can also buy simple plastic mudguards which clip on to the seat post at the back and to the down tube at the front. These were designed to be used with bikes with suspension which can’t mount traditional mudguards. Although they might be easy to use – they don’t really give as good protection from the wet as a traditional mudguard. Not all bikes, especially pure racing models, have the ability to take standard mudguards, so specialist racer specific ones are required. These are also designed for the particularly low clearance between the frame and wheels on this style of bike. If it’s raining and you don’t have mudguards, you’ll get wet. But this isn’t such bad news if you are dressed for it. If you are wearing decent waterproof trousers and a jacket, it won’t really matter. Likewise, if you are planning to change clothes at the office, and have somewhere to dry your bike kit, no matter either. Not having mudguards does have its advantages. Your bike will be lighter and quicker. And you’ll not have to worry about another part rattling as you speed along to work.